Cara came up with a list of wonder theme ideas and from it I chose shoes. She is so good at coming up with creative theme ideas. Look at her sweet shot of her little boy's saddle shoes. So incredibly adorable. I love, love, love the perspective of the shot too. My shot is from girl's night out last week. We had pedicures and then went out to eat. It was a great night. Can you guess which toes are mine? For more Team-Up Thursday go visit Megan. Oh, such CUTE shoes - upper and lower. I love the different angles also, one from above and the other low, low! Nice job. Great theme! Both shots are perfect. Your shot so makes me want a manicure! ;) I like 'em both. I think they go well together and each from a different perspective. I love feet! Both of these make me smile! Okay, so which toes are yours? :) And my, what pretty feet you and your friends have! LOL! the green ones? what a fun night out. love the different composition in each photo, too! Great theme. I adore both shots. the saddle shoes are priceless, and the friends shot is cool to see all the different shoes. Yeah, I would have guessed the green ones too! Are we right? Love this dipy! 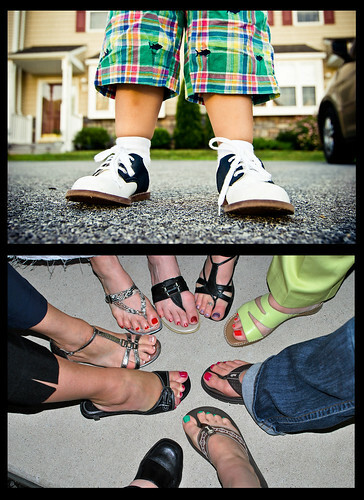 How fun the different angles and very different shoes are! i love those saddle shoes! it's amazing how a person's personality can come out in the color of their nail polish and type of shoes they wear. fun! Your shot reminds me of how much I need a pedicure!